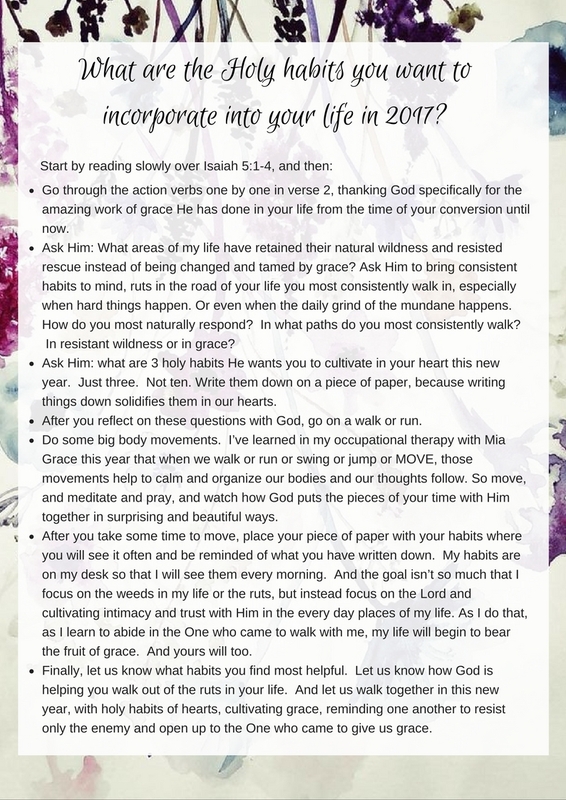 If you were able to take some time to walk through Isaiah 5:1-4, asking God to show you the areas of your heart that remain uncultivated and untouched by His grace, like me, you may have been surprised by some of the answers you received. And since adding a fourth child to our home and homeschooling my three oldest girls while still working on bonding and attaching to a toddler means I have the capacity to be in a constant state of stress, anxiety, and anger unless I am actively choosing grace on a day in and day out basis. “Smooth” just isn’t a daily word choice in our vocabulary and “perfection” has never been a possibility. Yet for some reason, in my natural, sinful habitat, I continue to look for it and demand it first in myself and then in others. Sometimes I am good at choosing grace (notice I said good, not great), and sometimes I am not so good. I am downright bad, actually. And throw in the fact that in February, we are getting ready to move everything out of our house into temporary housing or storage while we undertake a major remodel, while taking a week right before our move to attend a board retreat in Israel that has been on the calendar for months (more to come on that later), I have been doing a pretty poor job on managing my stress. In fact, last week, I think my internal stress-o-meter was measuring about a 10 on the Richter scale while scheduling and managing Israel dates, moving dates, and make up homeschool dates. So God did something to get my attention. On Friday morning, I woke up with swollen lips, eyes, and puffy cheeks, feeling like I had received a numbing shot FOR MY FACE at the dentist’s office. Not one to be deterred by minor details like a face that looked like Miss Piggy’s from The Muppets, I determined it was hives brought on by my stressful response to the week, so I took some benadryl and carried on in business as usual with my day, exercising, taking the girls to the Museum of Fine Arts to meet my aunt, eat lunch and see an exhibit, all the while feeling worse and worse. By 3:00, my face was still partially swollen, my lips drooping, and benadryl was not helping anymore. My husband, Jason called me on the phone and said, “You need to go to Urgent Care. Now.” So I did. And what I discovered is I had developed an abscess in my nasal cavity that had turned into a staph infection, causing all of the swelling around my face. It took two days of two different doctors, an IV of antibiotics, two rounds of oral antibiotics, and four long needles stuck through my lip and nose to drain the infection to get the swelling down and the infection reduced. Needless to say, my calendar was quickly cleared, and all of my focus and attention the past few days was placed onto obtaining the steps necessary to get the infection out and the antibiotics in. My focus went from hosting kid sleep-overs and watching basketball games to battling full-blown infection. In the meantime, all week, I had preparing to teach in our Sunday School class on II Samuel 12, the classic passage where the prophet Nathan confronts David about his sins of murder and adultery. I had been carefully examining the elements of confrontation, confession, and repentance, looking at how David appropriated grace, all the while missing the grace that was sorely needed in my own life. I listened to a sermon on II Samuel 12 by Tim Keller called “The Sinner,” and his words about Nathan struck me, even before my infection reared its ugly head. As I sat in that chair with my heart racing and my palms sweating, all I could think of was Nathan and David. And the prayer that rose up from heart and my sweat-soaked shirt was, “Lord, whatever You are trying to tell me, I AM LISTENING. I don’t ever want to have to repeat this lesson again.” I was tempted to bolt out of the chair and run out of the office as fast as my legs could carry me, never to return, but what was my alternative? To let the infection sit in my face, close to my brain, just hoping on a wing and a prayer that it would disappear if left alone? Not a chance. My only option was to go under the surgeon’s scalpel and let her get the sickness out. I had to let her kill the infection in my face so that it lost its potential to kill me. My friend, the reality is, the staff infection inside my face is less lethal than the sin infection inside my heart. And the time and rest and energy required to get the physical infection out should be but a small indicator of the time, energy and rest required to allow God to remove the infectious disease of stress, anxiety, worry, fear, anger, and control. Will it hurt? Yes. Will it be a major inconvenience? Yes. But what’s my other option? A slow, infectious death from the wild weeds of sin in my heart? No thank you. As I have thought and prayed this weekend, I have come to realize that I have let my view of myself grow bigger than my view of God. My self dominates and towers in my world as it wrestles to manage, control, and nitpick to perfection circumstances and people around me. I have relegated God to the corner, minimizing His capabilities, His strength, His all-knowing control, His mercy for my mistakes, His grace for my moments, and His wisdom for my day. My self has pushed Him out of the way, and full blown infection has ensued. I spent Sunday morning praying that the eyes of my heart would be enlightened to know and believe the all-sufficient character and power of Jesus. That He is not sometimes enough. He is always enough. For all situations on any sort of day. My prayer and challenge to you today is to walk with your eyes wide open. If you ask God to remove the unholy habits of your heart and replace them with His grace, don’t expect Him to show up at your door with a picnic basket in hand. He comes with a scalpel. To dig out with urgent attention and care the infections that are killing us, and to send us home with the orders to rest in His care, rest in His word, and take the daily medicine He prescribes of habitual repentance and the receiving of healing grace. Have you taken the time to ask the Lord to clean out the weeds in your heart this year? And if so, how has He responded? Are you listening to His messages and messengers of grace, even if they are causing pain and discomfort? If you haven’t taken time to get serious about your relationship with God, the state of your soul, and the fields He wants to clear this year, don’t delay any longer. In His Hand is the only place where true healing comes. For further encouragement this week, connect with me on Facebook. And to continue working on holy habits of the heart, creating space for God to speak, heal, and move, consider working through the study, Waiting on the Lord, asking God to transform the broken places in your life into the beautiful. The holidays are over, and the Christmas decorations are down. The gifts are put away, closets are cleaned out, and all the debris from Christmas glitter, wrapping paper, and pine needles has been swept up and either stored for next year or placed into the dust bin, and a sense of quiet normalcy pervades the air at our house for the first time in weeks. It’s the weary hush after the holidays, the pause of January as a new leaf is turned in the book of a new year, and we have a few quiet moments to think about what will be written on the pages of 2017. Much of what will be written, you and I have little to no control over. As much as I like to plan, strategize, dream, and pray, when it comes right down to it, my hand does not hold the pen writing the story for the new year. But I know whose hand does. And while I cannot control what He writes, I can control my response to His story. Turning 40 ushered me into a timely season of reflection. Through the lens of God’s grace, I’ve been looking at some of the patterns of my present that have their roots in the past, patterns that sometimes extend back 40 years. Patterns like seeing circles as closed rather than open and responding to people and situations in hurt and anger instead of patient trust and grace. Patterns like walking in the well-worn ruts of my life of self-pity, perfectionism, and deep-seeded fear because it’s easy and it’s natural and sometimes it’s all I know instead of choosing to walk in new paths that beckon through the Spirit of Christ and His Word, paths of abiding peace and unconditional love. And I’m telling you, with all that is in me, I don’t want to walk in these unholy habits anymore. Turning 40 has shown me that life is short and swift, and while pain can be real and circumstances hard, God is always good, and His grace is always real. But it’s up to me to choose the path I want to walk. I can keep walking in the ruts; I can keep listening to the same old voices of pain and fear that say I don’t measure up or can’t keep up. Or I can walk in grace. I started cracking up since resistance is my natural response to grace when it invades my life as well. And apparently, it was the response of the people of Isaiah’s day too. Grace comes down from heaven, chooses us as His own special possession, clears out all the stones and obstacles from sin through the death of His One and Only Son sent to die on our behalf, plants the person of Christ through the Spirit of Christ in the middle of our hearts and souls to give us all the resources we need to live the abundant, grace-filled life, sets a tower in the middle of our lives to watch over us, protect us, defend us from our enemies and meet our every need, and then hews out a vat from the rock of our hearts in which to store the harvest and good works our lives will produce, and then stands back to wait and watch expectantly for a good crop to come. I can honestly look at so many ruts and places in my life that even after over 30 years of being in God’s vineyard and receiving His loving, attentive care, still look wild, overgrown, unfruitful, and as if grace has never touched me. I know perfection is not something I can ever attain while still standing on this sin-cursed earth. But I also know that if I love the One who made me and trust His care, the untamed spots in my life should start looking like they have been touched and tamed by grace. As I pause to look ahead at the pages at 2017, I know cannot control the events that happen, but I know that I can control the habitat of my heart. I want to work on wacking at the weeds of its natural, sin-cursed wilderness and receive the planting of grace. For me, I know that grace begins with a purposeful, consistent habit of an open Bible, a journal, and a pen. Grace begins with God-reliance instead of self-reliance. Grace begins with meditation on God’s Word and specific commands and promises, taking time and effort to really think and process through what they mean and how they apply to my daily life. Grace is reading a command, and keeping it. Grace is knowing a promise, and resting in it. Grace is seeing an example, and following it (Motyer, Isaiah by the Day). Grace is trusting God to transform us into the people we have always wanted to be, into the people that are available for us to be, as we stop resisting rescue and give in to His grace. So this is the year I want to work on becoming the woman I’ve always wanted to be. Not through accomplishments, but through appropriating grace. For me personally, I know some of the holy habits I need to cultivate in my life for the weeds to be cleared and the good fruit to come. I know that when I humbly and consistently walk in these habits, change occurs. Sometimes change comes an inch at a time, but it is still change. And that is the road I want to walk. Consistently turning from walking in the rut of rejection, self-pity, or fear through the habit of thankfulness. I am learning when I am tempted to see the circle or situation as closed, to turn it into a times of thanksgiving – to be thankful for my friends, thankful for my children, thankful that in that specific situation I know God will bring good because that’s what He always does (Romans 8:28). I have a specific journal I placed on my desk, designated for these “thankful” moments instead of self-pitying moments. These are the habits the Lord has placed on my heart. What about your’s? Can I suggest something? Take a day. Take a day with your Bible, a pen, a journal, and some walking shoes to do some weed-wacking with the Lord. Weeds don’t come out of our hearts on their own, and ruts don’t just naturally fill in. In fact, left unattended, they only grow deeper with time. So take some time. And ask the Lord what unholy habits He wants to fill in with His grace. Don’t slit your wrists with introspective self-pity or despair, but allow the Lord in His kindness to lead you to repentance, showing you exactly where He wants to work. And trust me. He will. He will show you. He always does. Go through the action verbs one by one in verse 2, thanking God specifically for the amazing work of grace He has done in your life from the time of your conversion until now. Then ask Him: what areas of my life have retained their natural wildness and resisted rescue instead of being changed and tamed by grace? To answer the above question, ask Him to bring consistent habits to mind, ruts in the road of your life you most consistently walk in, especially when hard things happen. Or even when the daily grind of the mundane happens. How do you most naturally respond? In what paths do you most consistently walk? In resistant wildness or in grace? And then ask Him what holy habits He wants you to cultivate in your heart this new year. Ask Him for three habits. Just three. Not ten. And then write them down on a piece of paper. Writing things down solidifies them in our hearts, and we are far more likely to do those things then if we just think about them. And then, go on a walk or a run. Do some big body movements. I’ve learned in my occupational therapy with Mia Grace this year that when we walk or run or swing or jump or MOVE, those movements help to calm and organize our bodies and our thoughts follow. So move, and meditate and pray, and watch how God puts the pieces of your time with Him together in surprising and beautiful ways. And then, when you get home, place your piece of paper with your habits in a place where you will see it often and be reminded of what you have written down. My habits are on my desk so that I will see them every morning. And the goal isn’t so much that I focus on the weeds in my life or the ruts. The goal is that I focus on the Lord and cultivating intimacy and trust with Him in the every day places of my life. And as I do that, as I learn to abide in the One who came to walk with me, my life will begin to bear the fruit of grace. And yours will too. Let us know what habits you find most helpful. Let us know how God is helping you walk out of the ruts in your life. And let us walk together in this new year, with holy habits of hearts, cultivating grace, reminding one another to resist only the enemy and open up to the One who came to give us grace. Connect with me on Facebook this week for more help on cultivating grace and holy habits of the heart.